The power of abundance would seem obvious to most of us. The more abundance of things we deem as good, would put us in a position of power, right? An abundance of health, wealth, love, peace, happiness, friends, food, etc… is what most of us would find very satisfying, perhaps even fulfilling. We can deny the desires, but why should we say “no,” to what we really want? If we want to live in the country, travel, get married, etc….and we’re not doing it or moving in the direction of it, we have to ask ourselves, WHY? Abundance is unlimited, scarcity is limited. Abundance breaks the rules, scarcity colors within the lines. Abundance is relaxing, scarcity is constricting. Some of us feel guilty wanting more for ourselves and others believe we don’t deserve our dreams….and as long as we live in guilt or undeserving energy….we will continue to set up situations, which highlight scarcity. Abundance did not come to me easily. I was not brought up to believe love and money grew on trees (but they do provide for both) and that you had to work super hard to rub two nickels together. Getting to a place of allowing abundance in our lives can feel like we’re breaking all sorts of rules. We may abide by certain philosophies, which allow us to honor reasons to stay in scarcity. The power of abundance is scary, because it’s unlimited. If the Universe is made up of a creative energy that has an intelligence, a sort of matching us where we are energy….and our energy is about manifesting through thought and action, wouldn’t the Universe mirror it back to us? As humans we have no control over timing or what an outcome actually looks like, but if we believe in the power of abundance we can approach it as a wide-eyed child. Often life throws us a curve ball, but what if we approach dire or troubling situations from an unlimited, abundant perception? It could allow us to find the opportunity in a crisis. If we create rather than compete, we’re focused on the value of abundance–creating more rather than in scarcity, taking what someone else has in their possession. If more life is the goal of every living thing in the universe, we have to get clear on what keeps our “thinking,” in scarcity. Where are we limited and when did we come to believe this as our truth? The moment we engage in what we love, we are creating, when we’re creating…..we’re living in abundance. If we want to be in the Power of Abundance now, what can we do? 1. Believe there is more rather than less for everyone. There is no competition. 2. Find what you love to create and start creating, even if you think you are not any good at it, do it with love and do it often. 3. Once you are in the habit of creating with love, believe in the abundance of it, focus on it with a goal (even if the goal is just more time to do what you love) meaning look for opportunities to come from what you love. They will. 4. 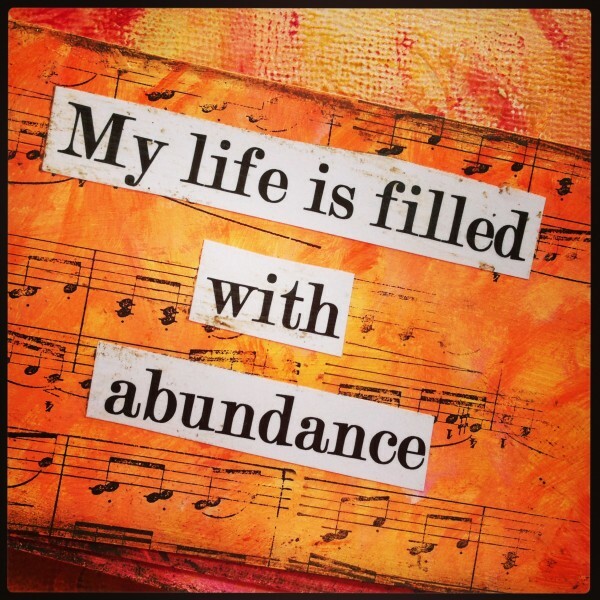 From abundance the opportunity to give and receive fully, becomes easier. We energetically connect to more when we get out of our own way and include others. Watch life change, as you become more accustomed to the unlimited, the possibilities that may have seemed impossible in the past, are now your reality.